Content or platform? What is making readers read differently? As it usually happens, once one comes across a good dataset full of all kinds of information, it is impossible to analyze everything. One of the questions I have only started to explore is the exploration of the role of incidental readers. What do I mean by incidental? It refers to over half the total number of readers in my Orsai dataset (+6500) who have commented only once or twice over the +2 year period under analysis. Because of their huge variety, it turns out to be pretty much impossible to go and look at each one of them and see their particular relevance to the larger reader community and the whole project. In other words, isolated, incidental readers appear to have little impact over what goes on in Orsai: basically the only conclusion that I managed to get to was an unhelpful “there are a lot of readers who have commented throughout the years in a totally random way”. The only way to look at them significantly was as a whole, not paying attention to whether it was made by someone who comments a lot or a one-timer, and they do turn out to offer a rather different picture. 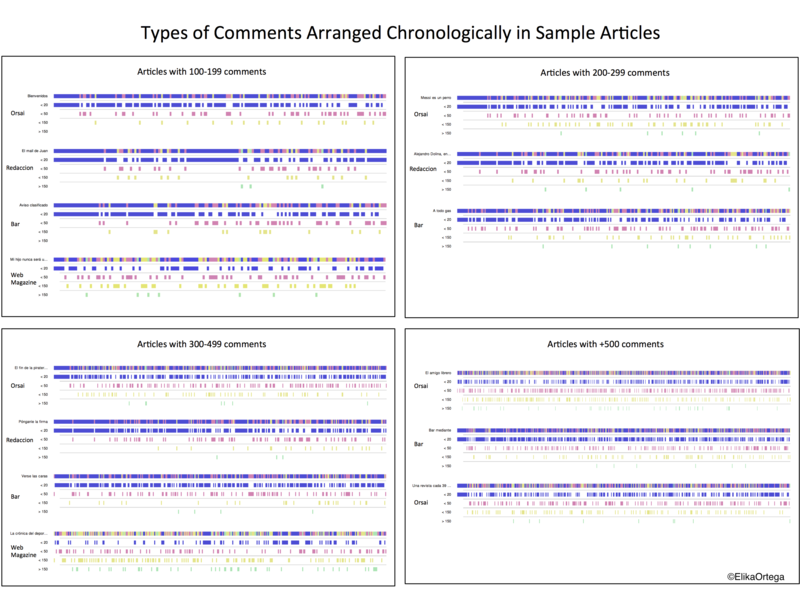 So, with that in mind, data cruncher super hero versae and myself devised a visualization that orders all of the comments left in a particular post both chronologically and according to our own depth parameters (-20 words, -50 words, -150 words, +150 words). Depth parameters, though arbitrarily established sought to account for patters observed in close reading explorations of the comments. We tested three hypothesis, the first is whether comments increase in length – and thus depth – from a simply greeting, for example, into a text’s gloss, in a patterned way. The second hypothesis had to do with a higher recurrence of a given type of comment in one of the four publications media under consideration (Orsai Blog, Redacción, Bar, and Web Magazine). And finally, more a question than a hypothesis: is it content or platform that is directing readers practices in this project. In these visualizations comments are put together in groups of posts with similar numbers of comments. Apart from what we already knew – that Orsai and Redacción blogs are the ones which consistently get higher numbers of comments, the first hypothesis is partially confirmed as, with some exceptions, it is indeed shorter (-20 word) comments that tend to be posted first, usually right after the text has been published, and then there is an unordered progression in length-depth, but a progression nonetheless. The second hypothesis is quite clearly confirmed, and it is impressive how, proportionally, posts in the Web Magazine (i.e. magazine articles) get longer comments, i.e. even with a reduced number of comments, these tend to be longer than those in other publication media. These results seem to point to the fact that reader involvement is indeed much different according to content in otherwise ‘twin’ platforms like the blogs and the web magazine. By ‘twin’ I mean having the same sort of interactive feature: comments, meant to be read on a screen, and published periodically (print magazine articles were included in the web version daily during a couple of weeks after the print edition was shipped to subscribers). Furthermore, a scarcer but longer and arguably more thought-out reader involvement with the print magazine contents, even in its web version, suggests that readers are actually enacting the slower rhythm of reading associated with print materials. The question, however, still is whether that is something we can attribute to the publication medium or to readers expectations and historically ingrained practices. P.S. This is likely the last post on Orsai and the remains of my PhD thesis dataset & project. Also, I will be presenting a fuller version of this project at the upcoming INKE NYC gathering.